Having read Ryszard Kapuściński's book on the early days of Angolan independence, I saw fit to indulge myself by purchasing his journalistic testimony on the last days of His Imperial Majesty, Haile Selassie I, the last Emperor of Ethiopia. 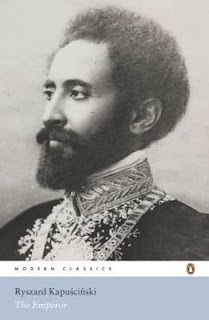 What little I knew I Haile Selassie focused around the Rastafarian movement's reverence of him and their collective perspective on him being a living deity, and also the idea that he was a direct descendant of the biblical King Solomon. Suffice to say, this does not prepare you for the true complexities of life in the Royal Court of Ethiopia: the division of time between various ministries such as the Hour of the Assignments; the feeding of the pet Lions and Flamingos whilst receiving informants' reports; the deep annoyance at Jonathan Dimbleby's reports on hunger in the north of the country; the infighting and corruption between ministers. A lot of the tale is told by former workers at the palace and fittingly ends with the the Emperor's personal valet, 'L.M', who was the last man in the palace with him as the monarchy finally ended. As a result, the storytellers hold a lot of bias in favour of the Emperor, such as proclaiming, inferentially at least, that it was partially Dimbleby's fault that the monarchy collapsed. You know how the tale is going to end, and, if it wasn't for Kapuściński filling in gaps in the narrative detailing Haile Selassie's flaws, you would be left feeling entirely sad that this ancient dynesty came to the end that it did.